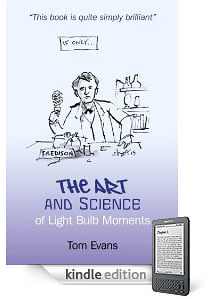 I am so thrilled that my new book, The Art and Science of Light Bulb Moments, has now made it on to the Kindle platform a couple of weeks after it was available in print. Especially as I have just been reading about how US-author John Locke has been going about selling over 1 million books in a few short months – see my Bookwright blog for details on this. At the same time, bookings are coming in thick and fast for talks on how to experience light bulb moments on demand – see the schedule here – and contact me if you have a group you’d like me to talk to. I’ll also be sharing some new about the full workshop programme I am launching in the UK in Autumn and extending worldwide to 2012. It’s a real testament to the doors writing a book opens to an author … watch this space.